Mega Cap Stock - What Does It Mean? 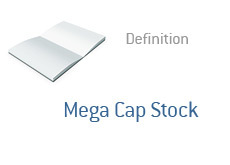 What is a "mega cap stock"? What is the definition of a "mega cap stock"? A "mega cap" is any stock that has a total market cap of $200 billion or more. This is a very elite and prestigious group to belong to - only the biggest and best-known publicly traded companies in the United States can claim "mega cap" status. There are a few companies that are very close, including Berkshire Hathaway and Apple. Apple, which is just about to break into "mega cap" status, will break the mold in some ways compared to their respective "mega cap" peers. Apple has tremendous customer loyalty and is thought to be a "good" company (in terms of good vs evil). ExxonMobil, Wal-Mart and Microsoft have all been embroiled in their fair share of controversies across the years, whereas Apple has not.